Royal Caribbean has released a new video showcasing the cruise line’s upcoming ship Ovation of the Seas. The third Quantum class vessel will be homeported in Tianjin, China and will add some small features catering for the Chinese market. The video teases us and reminds us that it’s almost time for delivery but to be honest it will be difficult for the ship to get all the attention as April will be a busy month for new cruise ship arrivals. 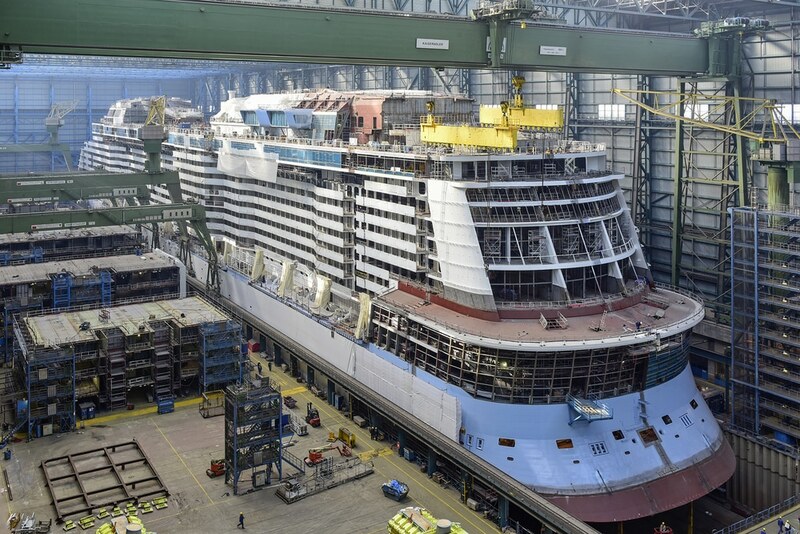 Ovation of the Seas is currently in the final fitting out phase at the Meyer Werft shipyard in Papenburg, Germany. Just 5 months ago the ship was in blocks but now the build up has started. The ship will be 167,800 gross tons and carry 4,180 passengers at double occupancy. Once the ship is delivered to Royal Caribbean it will sail a series of cruises from Southampton, UK before heading off towards China. The ship will sail on May 3rd 2016 on a 52-night adventure that will end in Tianjin, China at the end of June 2016. After that Ovation of the Seas will sail the 2016/17 winter season in Australia.